The government shutdown may be over but some farmers say they could feel the impact for months to come. 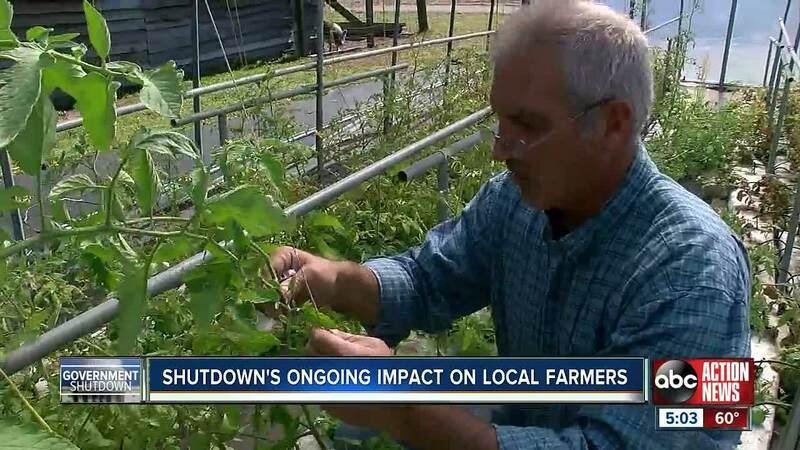 HERNANDO COUNTY, Fla. — The government shutdown may be over but some farmers say they could feel the impact for months to come. Frost ruined a lot of Michael DeFelice's cucumber crop which is part of the small farm he’s spent his life savings to build. "Stressful, it’s stressful," said DeFelice. DeFelice had everything in order to use federal grant money to help him buy new greenhouses to protect his crops and expand his operation, but the shutdown caused him to lose the deal he worked months to get. "What frustrates me the most is that I don’t feel that big government is appreciative to what it's doing to people here on the ground," said DeFelice. Rebecca Krassnoski’s small hog farm also suffered big from the shutdown. Krassnoski had been working for eight months on a deal to expand her farm using a federal loan, but the shutdown caused her to lose the deal. "I don’t think people take into consideration how important timing is in farming. 30 days of off-setting the process can fold a farm," said Krassnoski. Although the shutdown is over for now, these small farmers say will be recovering for months to come.